New York City Mayor Michael Bloomberg with his mother, Charlotte at the dedication ceremony Nov. 24, 2003 in Jerusalem, Israel. Charlotte celebrates her 100th birthday on Friday. Here's looking at you, mom! 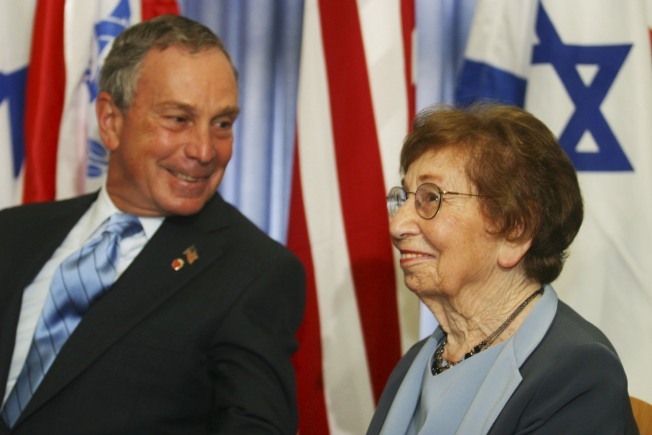 Mayor Michael Bloomberg's mother Charlotte is hitting a milestone. Friday is her 100th birthday. "My mother is looking forward to her birthday and for many years to come," the mayor told the N.Y. Daily News on Thursday. Bloomberg and his sister Marjorie Tiven plan to celebrate with their mother at her Massachusetts home. Bloomberg credits her long life to her optimism and always looking at the bright side. "She always has a bright side of things to look at. She doesn't stop whenever there is a problem. She says, 'Okay, here is the problem. Let's just do it,'" Bloomberg said. Bloomberg says his mother remembers electricity coming into the apartment of house she lived in and gas lamps going out. She remembers the first car in the neighborhood. Today, she carries a cell phone and emails.